When you watch Game Six of the Celtics/Heat series tonight, watch out for KJ and Hondo. Either we’ve stepped into a time machine that takes us back to the 60s and 70s when John Havlicek was playing guard for the Celtics (and Red Auerbach found a KJ outside of Kevin Johnson who never played for the Celtics to begin with and is now the Mayor of Sacramento, California) or Boston’s Mayor Tom “Mumbles” Menino showed once again that he has no interest in the sports in his town. Unfortunately this is not the first time that Menino gaffed the name of a few of Boston’s most prominent athletes. This past football season before the playoff matchup against Tim Tebow and the Denver Broncos, Menino talked of Tom Brady’s receiving weapons as “Grabowski” and “Wes Weckler” instead of obviously Rob Gronkowski and Wes Welker. Sadly that’s not even the worst Patriots reference by Menino. Did y’all know that it was (Red Sox catcher) Jason Varitek who “split the uprights” to win the Pats’ first Super Bowl in 2002? All these years I thought it was Adam Vinatieri. Such an amazing goal it had to be “ionic”, right? 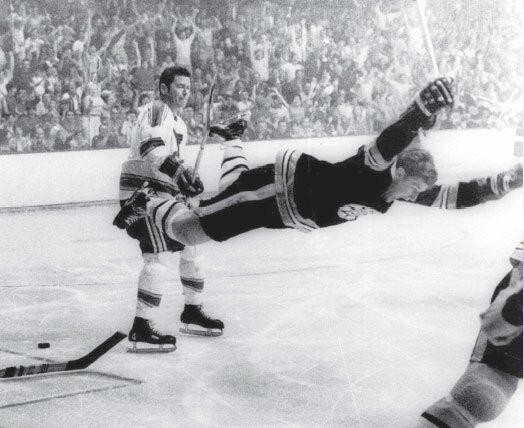 Menino also screwed up a big moment in Number Four Bobby Orr’s hockey career, as during a ceremony to dedicate a statue to the Bruins legend he referenced it as an “ionic” goal to win the 1970 Stanley Cup. I always thought the only chemistry involved in hockey was between teammates, coaches, and staff, but I guess it might take more than that to win a Cup. It took the Bruins 29 years from the last championship they won with Orr until they brought the Cup back to Boston after the 2010-2011 season, so maybe he was on to something. I understand that people make mistakes, and I am far from the best public speaker myself, but “C’mon Man” do your research before your open your mouth. It is really not a good look when an elected official messes up something so simple and when you start to have a track record of mispronouncing names that everyone hears on the local news EVERY SINGLE DAY, it really makes you wonder how is actually performing at his job (you know, with that stuff that matters). There is really no defending “Mumbles” here, but at least he’s got a sense of humor and can laugh it off. And hey, these moments might not even be as bad as another government official in Massachusetts, the late Senator Ted Kennedy, who introduced the home run leaders of the 1999 MLB season as Mike McGuire and Sammy Sooser (of the White House?) to an assembly in Boston. This entry was posted in General, NBA and tagged Boston, Hondo, Kevin Garnett, KJ, Mayor, Public Speaking, Rajon Rondo, Sports, Tom Menino. Bookmark the permalink.